Pepe Espaliú’s work began from constant autobiographical reference, which he built into a personal catalogue of plastic metaphors on literary and philosophical foundations. These were directly influenced by Jacques Lacan’s seminars, which he had taken part in during his stay in Paris in the 1970s. Espaliú applied his interest in conceptual aspects of the body experience to his sculpture, which evolved into public actions through his involvement in the battle against AIDS. 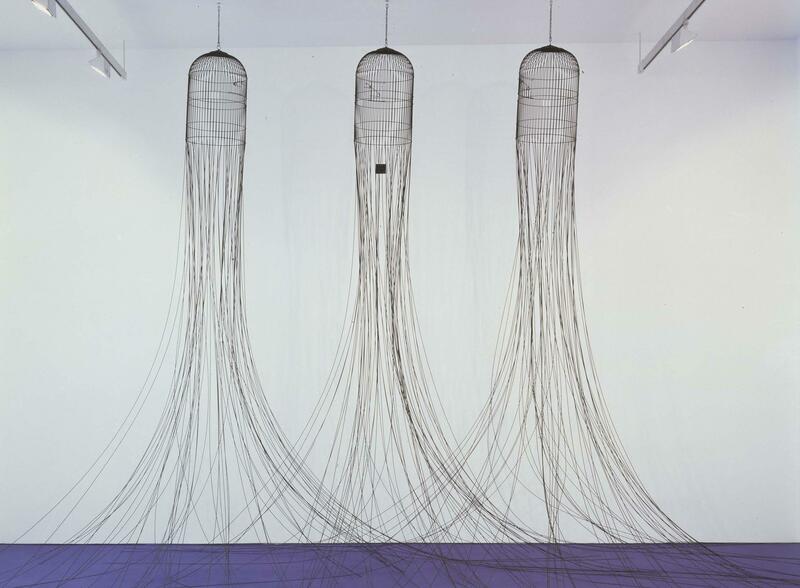 In Sin título (Tres jaulas) (Untitled [Three Cages]), done just a year before his death, the cage is a reference to the body as both a hollow space and an imprisoning container, in a linguistic game between the transparency of the composition and the opacity of its meaning. The cages’ bars, rather than being joined and closed, actually expand outwards and intertwine at the bottom, alluding to a link between bodies that is less deterministic, more free and more based on chance and accident. Sin título (Tres jaulas) deals with aspects of identity, corporeality, the relationship with the other and sexuality, using the everyday form of the cage, seemingly so minimalist yet so loaded with connotations, defying its own structural boundaries as it expands out into space.